Chelsea Handler shows why you should get fractional laser - 111 Harley St. Call to book with a top London plastic surgeon! 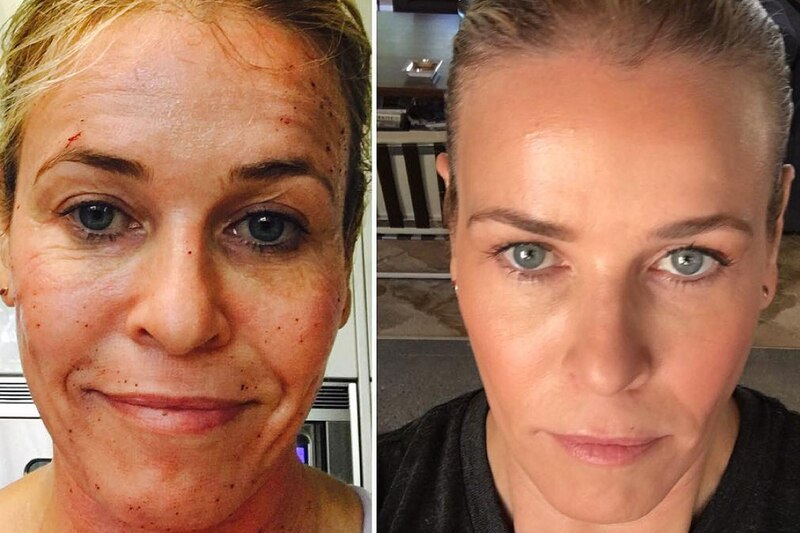 Chelsea Handler took to Instagram to show off her amazing post-laser results. In the post she shares a before and after image. The first image to the left is her skin before the treatment. It’s hard to believe that this photo was not doctored in some way as she appears to have noticeable wrinkles and pigmentation of which you do not often see. However, Chelsea claims that it is all her. On the right hand side is Chelsea after the fractional laser treatment. You can see an incredible difference. The pigmentation appears to be completely eradicated and the wrinkles are completely diminished. Chelsea protests that the image isn’t part of a PR campaign insisting that she hadn’t been paid to promote this treatment. Fractional laser is a laser treatment used to resurface the skin and diminish the signs of ageing such as: wrinkles and pigmentation. The treatment creates trauma to the skin and the skin reacts by renewing and regenerating the skin’s surface very quickly. It creates new collagen and evens out the skin tone and texture to make it look smoother. Think of a photograph when you see it on the screen. If you zoom in you will see the individual pixels that create the whole image. The laser works by targeting a fraction of the skin (similar to a pixel) one at a time with a laser beam. Each time the laser encounters the skin it reacts in a different way depending on the problem with the skin. The laser is very effective as it can reach both the epidermal skin cells (surface level) and the dermal layers (mid-layer). The targeted approach means that affected areas are treated intensively, whereas healthy tissue remains intact. This process allows each treatment to be tailored to a patient’s individual skincare concerns. It seems that Realself users agree with its effectiveness, since 72% of RealSelf users treated in the past year say that it’s worth it. How much surgery has Sharon Osbourne had? The outcomes from cosmetic surgery can vary significantly between patients. Every patient is an individual, and each operation has unique aspects. Therefore we are unable to guarantee that any two procedures will achieve the same result.